This UI is optimized for healing in PVP using a Razor naga mouse (or any other mouse with a full numpad on the thumb) with the operative in mind. It focuses on minimizing real-estate of non-pvp components, eye movement, and mouse movement while maximizing awareness of battle, access to a plethora of situational abilities, ability hotkey intuitiveness by grouping, and of course aesthetics. Although not shown, the large blank area in the middle is where the raid frame goes. Nothing interesting about this. Immediately to the left is the no-modifier ability frame; it contains my main abilities (healing mostly). To the left of that is the shift-mod abilities. These are mostly defensive and buffs. They are closest to the no-mods so I can see their cooldowns. 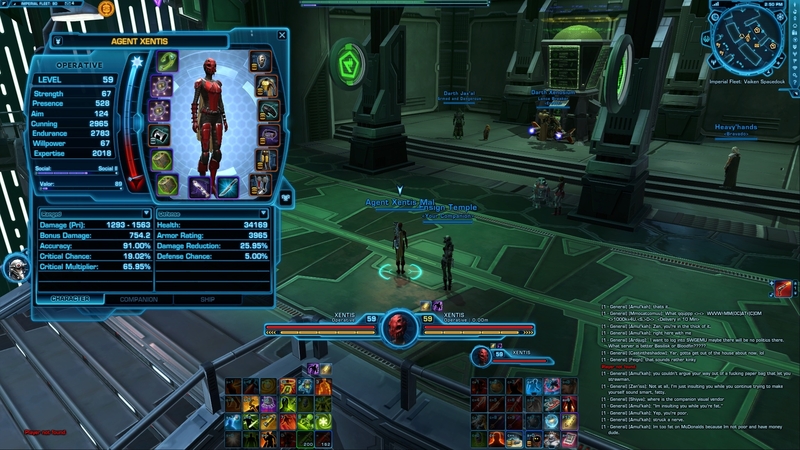 On the right side of the raid frame is the ctrl-mod ability frame containing offensive abilities. To its right is the alt-mods, but I usually click them instead of using a hot key. They are things often used out of combat. The important abilities in this frame (like mount) are mapped to other keys on the mouse (button 4+5 with mods) and I usually use them. Above the no-mod and shift-mod frames are my buffs/debuffs, nice and big so I can see my kolto probe, the new procs in v3.0, and cleanse-able debuffs. Above the ctrl-mod and alt-mod frames is target-of-target. Above all this is the self/target frames, cast bars overlaying the name fields when visible. I was bummed I couldn't modify the target's buff/debuff frame, so they remain attached to the target frame. The profile busts of self/target are useless so I overlapped them to avoid screen real estate loss. On the sides, I have two chat windows: left for important chat (whisper, ops, group) and the right is everything else. I may change this in the future since it requires extra effort to see callouts for help. See the PLAY STYLE section about eye movement. As mentioned in the first paragraph, I made this UI with optimizing certain components for my play style in PVP. I prioritize mobility in warzones quite heavily, especially so in huttball. My camera is very far back (about 70% I think) which allows me to find optimal AOE heal opportunities from stacked up allies. It also helps me see impending spike damage, huttball passes, etc. For warzones (and PVE too), awareness of the battlefield is critical which is why most of my real estate is free of components. UI components on either side of your character is too detrimental to your awareness so I advise against it. For eye movement, everything important is closest to the middle: raid frame, main abilities (cooldowns), buffs/debuffs, and of course the battlefield. While looking at any of these components, the others are in the peripheral to keep them monitored. My eyes rarely move horizontal except for battlefield-related events. Chat is the exception to this; it remains way off to the side. I will try to find a solution to this. Mouse movement is very much the same as eye movement, it genrally stays in the raid frame, but I often move it upward to the free-space to adjust the camera and strafing. In certain cases, I will click on a character to heal instead of their raid frame item, but this is only in rare cases like when they are engulfed in affects and I cant identify who they are in the raid frame. Don't forget F1 for targeting yourself! With the actions almost entirely on the mouse, that leaves the left hand for mobility and modifiers - and thats more than enough for one hand. Although this UI is made for operatives, the v3.0 patch prioritizes mobility for all classes. The separation of concerns between the left and right hands is the difference between players who can focus on both goals of the game, and those who can only do one when it really matters. 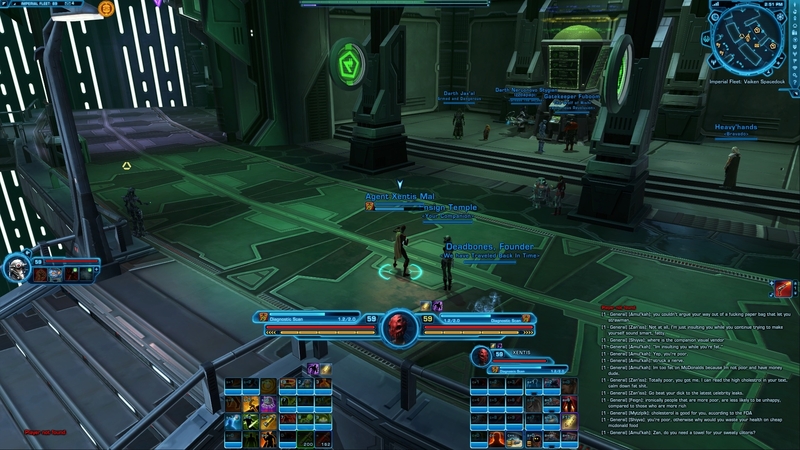 The goals being 1) assuming the role of your class (healing yourself and your group) and 2) winning the match whether that means staying alive a couple extra seconds to prevent a cap, catching a huttball, or being in the right place at the right time. The first goal is primary based on ability execution, while the other is primarily mobility - things like line-of-sight and position relative to cap-points and your teammates.